Located 270 meters above sea level, Guanziling is famous for its hot springs and temples. It is east of Peihou Town in Tainan. The attractions here include the Guanziling Hot Springs, Hongye (Red Leaf) Park, Piyin (Blue Cloud) Temple, Tahsien (Great Immortals) Temple, Shianching (heavenly view) Theme Park and Water and Fire Spring (Suifortongyuan). At the peak, there are resort hot spring hotels, restaurants and tourist shop area. Guanziling Hot Springs, Beitou Hot Spring, Yangmingshan Hot Spring, and Sihjhongsi Hot Spring are said to be the 4 major hot springs of Taiwan. Created by the earthquake at Baihe Town, the Guanziling Hot Springs are located in mud rock formations. Thus the hot spring water is dark grey and bitter. 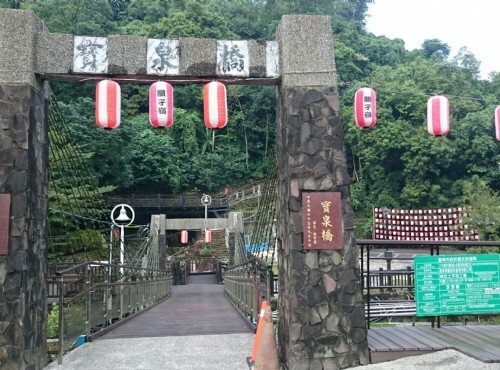 It also derives the name of “mud hot spring” and “black hot spring”. It is said that the sulfuric properties of Guanziling Hot Springs have healing qualities for a number of skin, nervous, and joint problems or discomforts. In addition, Guanziling Hot Springs and its mud-properties will leave the skin feeling soft and smooth, and thus it is also regarded as a natural source of beauty treatment. Located at the side of the mountain, there are many hot spring resorts, restaurants, and swimming pools available. There is also a unique place to watch scenery where the natural gas co-exists with the spring water. When fire makes contact, a peculiar sight of fire and water is created. Take train to Xinying Train Station (新營火車站). From there, take Xinyin Bus (新營客運) bound for Nanliao (南寮) or Guanziling (關子嶺) to Guanziling stop (關子嶺站).